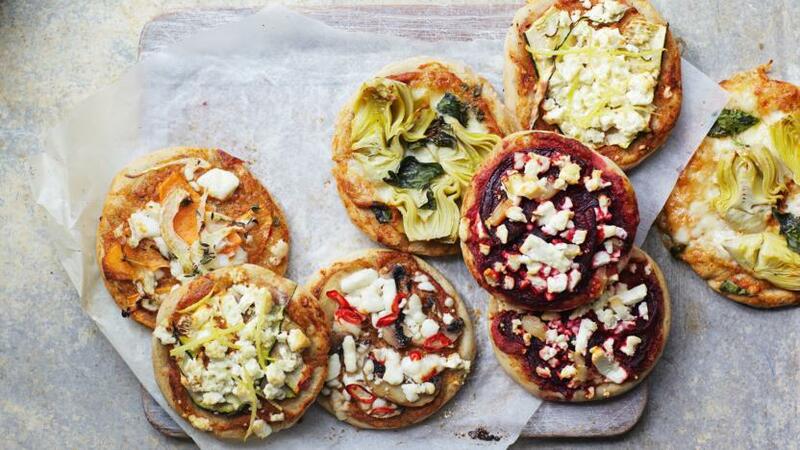 A spelt flour pizza with three delicious flavour combinations to choose from. The pizza toppings ingredients below are per mini pizza, so double or quadruple the ingredients, as necessary. Each mini pizza provides 168 kcal, 5.4g protein, 29.5g carbohydrate (of which 2.7g sugars), 3.4g fat (of which 1.2g saturates), 2.4g fibre and 0.4g salt per portion. For the bases, mix the yeast with 170ml/6fl oz of lukewarm water, cover and set aside in a warm room for about 15 minutes. Meanwhile make the sauce. Heat the oil in a pan and gently fry the onion and garlic until the onions start to go soft. Add a splash of water to cool then add the remaining ingredients. Simmer for 15 minutes, or until thickened. Set aside until ready to construct the pizzas. For the bases, whisk the yeast and water mixture and set aside for another five minutes. Place the spelt flour and salt in a large bowl. Make a well in the centre and pour in the yeast mixture. Mix to combine then turn out onto a lightly floured work surface and knead for 5–10 minutes until smooth and silky to the touch, adding a little more flour if necessary. Divide the bread dough into eight pieces, roll each piece into a ball and place on a baking tray lined with baking parchment and flatten into a circle. Smear on some tomato sauce followed by your choice of toppings and bake for five minutes. Rotate and bake for a further five minutes, or until the base is crisp.